A blog about Public Relations, Mass Media, Communications, Advertising, Creativity and other catchy topics! | Едно място за идеи, пъблик рилейшънс, медии, комуникации, реклама, новини и... други интересни теми! 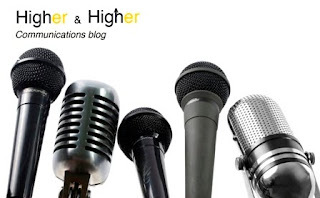 I am glad to present you my new blog: Higher and Higher. This new blog continues the endless and dynamic dialogue on communications, PR, advertising, marketing, and creativology. But there are some changes. Indeed the new blog is an refreshing update of this blog - the address and the platform are changed, as well as the whole concept is renewed. The blog will be written only in English in order to stimulate discussion between people from all over the world who are united by their passion to communicate. Effective communication leads to higher results. No matter in which field, it is an essential key to sustainable development. Higher and Higher supports this concept. As a creator of Higher and Higher, I seek to provide useful and fruitful information: examples of best practices, creative ideas, catchy topics, interesting case studies, significant news in the field of communications, public relations, marketing, advertising, social media, and creativology. Being a PR specialists is not a profession, but a lifestyle. I believe in this. That’s why I am passionate about working for higher standards and results in the field of (mass) communications. My Higher and Higher blog gives me an opportunity to share my professional thoughts, opinions and impressions, to comment and analyze the fast-changing world of communication in all its aspects. All articles express my personal understandings, professional beliefs, thoughts and impressions. Hopefully, with lots of work and passion, this blog will turn into an integrated marketing communications hub. It will be great if you enjoy Higher and Higher and find interesting topics there. But I will be even happier if you engage with comments, recommendations and points of view, because feedback is the most valuable step in the communication process. I will be looking forward to hearing from all of you soon.